DonorSnap provides an automated tool to move all of the activity records (Donations, Notes, Volunteer hours, etc.) from one Contact (Old Contact) to another Contact (New Contact). This tool is useful when duplicate Contact records are discovered in your system and you want to consolidate all activity under one Contact. 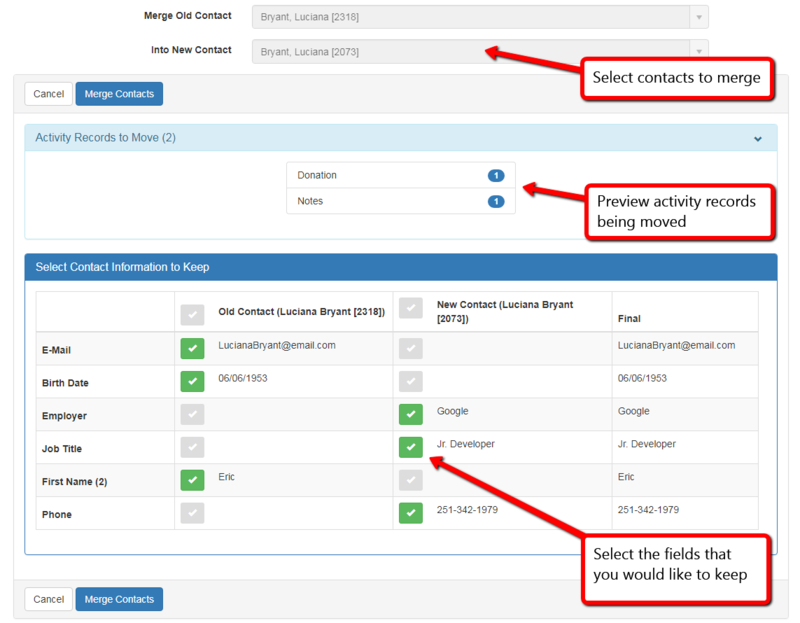 When merging Contacts, DonorSnap will first need to know who the “Old Contact” is and then who the “New Contact” is. Once identified, DonorSnap will preview what the merge will look like. 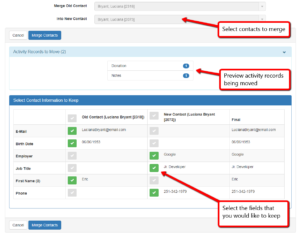 At the bottom it will show you all the differences between the two contact records and give you the option of which fields you would like to keep. The Old Contact will be flagged as “Inactive”, not deleted, and a note will be created in both records. This is helpful in case you forgot to manually move any Contact information (email, phone number, etc.). Once verified that the “old” contact has no needed information, you can delete that contact.